All your projects, processes and customers accessible to all employees in a single package. Azor is a project administration suite that is both easy to use and extremely flexible. It is based on FileMaker, the leading database software for businesses, making it the perfect choice for meeting your needs. 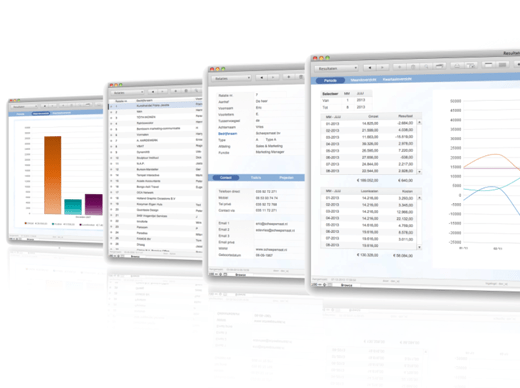 Azor was developed in FileMaker, the user-centric database software trusted by millions of professionals daily. Azor is a one-stop-shop for all project data. It gives you an immediate overview of key project data: budget, profitability, participants, activities and costs. All your customer and relationship data are clear and easily understandable. Azor supports you in assessing leads and prospects by segment, industry or sales channel. If you combine it with the To-Do module, then you can plan and check off every step in the sales process. All your relationship data in a single place. Create a sales machine with FileMaker. Want to gain a better overview of scheduling? Want a better handle on your projects? We use FileMaker ourselves for project support. No more copies floating around. A single database accessible to the right people. A professional database, not some plain old Excel sheet. We recommend it to everyone. Support personnel with the right tools at each stage in the process. Give customers clear, high-quality answers to their questions in a beautifully designed format. Insight into complex data issues in a user-friendly form. € 2.499,- One-off purchase excluding yearly maintenance contract. € 8.999 One-off purchase excluding yearly maintenance contract. Contact us Custom made One-off purchase excluding yearly maintenance contract. Chances are you are currently using other financial applications: bookkeeping packages, accountancy software, direct marketing and/or e-mail marketing applications, websites/web shops. Want to find out how much it would cost to integrate them? Projects, processes, customers and staff. That's what it's all about. Once the data is input, it can be used in multiple modules. This prevents needless duplication and reduces the chance of errors. And if you have a growing business, then Azor can grow right along with you. It scales seamlessly.